While outdoor gardening is a timeless hobby that spans all any groups, indoor gardening is rapidly growing in popularity as well! There are numerous indoor gardening supplies available on the market today, and finding the right ones for you can sometimes be tricky. Here are a few suggestions to help get you started. Greenhouse Kits: Greenhouse kits generally consist of a combination of three different indoor gardening supplies. The first is the flat that forms the bottom of the kit. For indoor use these are generally packaged as “no hole” flats, which as the name implies, is a solid sheet of plastic to catch the excess water. The second part is the seedling tray. This is the part that the seeds and potting soil are put into, that will eventually form the starter plant. The third component is a clear humidity dome that fits over top of the kit and helps create a humid micro-climate for germination. Each of these indoor gardening supplies are available through most vendors, but prices tend to fluctuate greatly in the greenhouse supply industry, and if you are ordering online, you may want to find a vendor that offers free shipping. Some vendors will sell the product extremely cheap, only to markup the shipping costs to above normal prices, so do your homework. The seedling flats are typically available in 3 versions, no hole, with holes, and web flats. The first one we've already covered. The second version is nothing more than a no hole flat that is put through one more step in the manufacturing process, having holes melted into the bottom for drainage. The web flat is completely different. These indoor gardening supplies are not formed from a solid sheet of plastic, but rather are produced with a bottom “webbing” formed out of interlocking X’s, hence the name. These are generally the least expensive trays on the market, and they work very well for outdoor applications or other instances where water drainage isn't a concern. 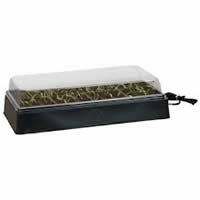 The seedling tray itself is one of those indoor gardening supplies that come in a wide range of options. They are generally chosen according to “cell count”, or the number of planting holes on the tray. You can buy them with as few as 6 cells, or as many as 512. The most commonly found tray is a 72-cell. You can get them in disposable “break apart” sheets, or in heavy duty versions designed to be reusable. Whatever your situation, there is a seedling tray out there that fits your needs. The humidity dome is rather standard and only mass produced in one size and style, although you will from time to time find a vendor selling a tall dome that will allow the seedlings to grow much longer under cover. These are not widely available items however. Manufacturers produce indoor garden supplies in just about any size you can find a use for, and arguably a few more size you might not. For most of these flower pots, someone somewhere makes a saucer to fit it, allowing it to be used indoors without creating a mess. The most commonly found saucers are the clear vinyl ones. These are not made to fit the pots specifically, but are intentionally made in generic sizes, to be used with the largest assortment of pots on the market. You will most often find these saucers at the big box stores, and even in the produce and floral departments in the larger grocery stores. Generally these indoor garden supplies are widely available as small as 4” in diameter, and sold as large as 21” in diameter. If you have a pot with a bottom dimension in this range, chances are they have a saucer that will fit it nicely. Alternatively, most manufacturers produce a clip-on saucer to fit the most common sizes of pots, like the 4” and 6” pots. These are not as commonly found, and even harder to find in small quantities, but they are out there if you ask for them specifically; sometimes in an assortment of colors. Hanging flower baskets are one of those extremely versatile indoor garden supplies because you can use them without the hangers as standalone planters. 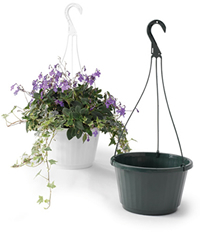 Hanging baskets are produced in a handful of standard colors, but in a rather large assortment of styles and patterns. The most common sizes are 8”, 10”, and 12”, but you will also find them as small as 6”, and as big as 16” that can still be used indoors. The standard sizes are all produced in a “with saucer” style, which means there is an external saucer that snaps into the bottom of the basket. While the saucerless versions can still be used indoors as well, they have a very small reservoir in the bottom to catch excess water. The larger, more expensive designer baskets will have plugs or “knock outs” molded into the bottom, allowing you to use them as either style. If you are planning on using a basket that does not drain the water into an external saucer, make sure it comes with an internal plastic water disk that is designed to elevate the soil off the bottom of the basket, so it doesn't sit in standing water. If you purchase indoor garden supplies without this feature, you will need to add rocks or the like to the bottom, to give the soil adequate drainage. Decorative Planters: These indoor garden supplies have exploded onto the retail market over the years and now there are planters to be found in every shape, size, and material imaginable. These pots are found just about everywhere, albeit seasonally in some locations, and they tend to be at the upper end of the most price ranges because of their detail and durability. While there are far too many options to do them justice here, they do get a mention because these types of planters typically are produced with “knock outs”, or plugs in the bottom, that you can leave in and use them indefinitely indoors.